For most particle and subatomic physicists, Special Relativity is beyond doubt a highly predictive and accurate theoretical framework. To them, the empirical and very physical phenomena mapped mathematically by Special Relativity Theory (SRT) is very real and very measurable. But understanding the cause for these effects is not easily intuitive if all you have is data on the measured effects, which is what leads some to question these effects and SRT individually or collectively. I truly believe the reality of these effects, and that of the best modern predictive framework mapping them, Special Relativity (SRT). This doesn’t mean that Special Relativity (SRT) is absolutely correct void of all problems. One major problem with Special and General Relativity is the disparity between gravity and quantum theory. Another is the in ability by General Relativity Theory (GRT) to predict the anomalous rotational velocity of spiral galaxies without the use of yet discovered hypothesized Dark Matter. Then there are the extremes of SRT and GRT that have truly never ever been experimentally verified, like having a quantum particle actually achieving the velocity of c in a particle accelerator, even though they’ve come close matching the Lorentz factor velocity curvature. I am certain this space-time medium is related to the ill defined Higgs Field, but FSC’s quantum medium gives a very explicit, and more importantly, unavoidable description of the medium that is not only highly intuitive but also very predictive. Basically, this medium fills all of Universal space to varying densities measured indirectly as varying gradient gravitational fields. Essentially this medium is the “ether”, but not the classical versions of the ether, which is a very important distinction. It is the modern “new” ether to quote Einstein himself in response to a challenge by Lorentz. The problem is Einstein didn’t explicitly describe this medium in his Special Relativity Theory (SRT), though he did re-introduce such a concept explicitly described in his General Relativity Theory (GRT) many years later using continuum mechanics. I believe this, along with changes to fundamental dimensions, introduced a level of intangible non-intuitiveness in the theory that has bothered many over the decades. Simply, SRT was void of such an “etheric” medium in the derivation of the theory whose mathematically predictive results matched empirical data…or was it really devoid of the “ether”? You see, Einstein used the Principle of Relativity and Constancy of Light in any inertial frame of reference, without the use of a mechanical ether concept, to essentially re-derive the work of Hendrik Lorentz in the Lorentz Ether Theory (LET). In fact, the Lorentz transforms are explicitly used by Einstein in SRT. Therefore, indirectly Einstein is indeed referencing an “ether” medium if only through the works of Lorentz in LET. What Einstein ingeniously did was map the effects, though in that time it’s better said he predicatively mapped these effects, independent of any assumed cause for them in order to match the empirical anomalous data of the time. It is essentially what Newton did with his gravity theory many years prior. It is called famously “Hypotheses non fingo“, or “I frame no hypotheses.“ What this means is that Einstein, like Newton, framed no assumption to the causes of the effects measured empirically. In this case it was the Michelson-Morley Experiment (MMX) and Maxwell’s Electromagnetic framework, with all it’s supporting empirical evidence, that Einstein had to map into a mathematically predictive framework…and he did so successfully, even though it appeared highly non-intuitively, especially because the transformation on the dimension of time itself which was new and perplexing to some. Now Einstein did make some assumptions outside of a possible underlining cause for these phenomenological effects, which makes me strongly question whether he truly was devoid of the “ether” concept in formulating SRT. I truly believe Einstein used an “ether” model as a conceptual tool in his derivations. Why? Indirectly, in the era he lived in, the “ether” was a mainstream concept. The fact he referenced Lorentz’s LET work, he understood the latest contemporary “ether” concepts. Also, his assumption of the Constancy of Light involved the concept that the Speed of Light (SoL) was independent of the light’s source speed (the photon emitter). This effect is analogically and empirically observed with waves in fluidic mediums, like water. This is coincidentally truly something very “etheric” to assume independent of using a fluidic medium concept. The point of all this is that the phenomenological effects mapped mathematically by SRT, and GRT also, can be explained with a very unique “ether” model, a model in which distortions in the density of this “ether” medium changes the dimension of time and distance relatively as observed inside and outside those density distortions relatively. This is what my own research into FSC is exploring using FSC’s quantum medium which I believe sheds good light on the gravity vs. quantum theory disparity in modern physics. At v=0, no Doppler Effect is measurable. At v >> 0, a measurable Doppler Effect is present. And at v = c, the Doppler Effect has reached its “luminous” Mach limit. What is important to see here is that the geometric Pythagorean representation of competing velocities also represents an aerodynamic/hydrodynamic-like compression of the medium in front of the traveling matter object. The region in front of the craft is called the bow shock, which is compressed medium due to the craft pushing through the medium using propelling force. This compressed medium is then essentially denser compared to the medium’s density if the craft was at v = 0. It is also denser simply because the object is traveling through the medium, and equally the medium is traveling through the object, at a faster velocity. Essentially the pressure and density of the medium on the object’s material structure is proportional to the velocity of the object through the medium. As an aside, this increased pressure and density of the quantum medium due to relative velocity is essentially the mechanistic cause for scaling in my fractal scaling cosmological (FSC) framework of macroscopic objects. Due to this increased density, the mechanistic cause for time dilation gives rise to time dilation and slows time down by a specific velocity dependent functional factor as to have the observer in the craft to still measure the beam of light as traveling at velocity c away from the craft, even though another more stationary observer measures a luminous Doppler Effect between the craft and the leading beam of light, meaning c – v is still measured as c by the moving observer in the craft. Mind boggling isn’t it?…or is it really. Keep in mind the mystery of these effects dissipates as you come to fully realize the mechanistic cause behind the entire dynamic (keep reading). In particle accelerators, electric force pushes charged quantum particles against and through this medium. This pushing through the medium can have measurable effects matching the effects mapped by SRT, such as mass increase (MI) and length contraction (LC). But it was time dilation (TD) that really set apart the effects mapped by SRT and those mapped by LET and normal aerodynamics / hydrodynamics. This is very important to note and realize. Why? Because the medium we’re dealing with here is not made of normal known matter like water or air, but is made of the stuff that makes up quantum particles (a literal quantum medium as per FSC). I call it quite justly the quantum medium. In FSC, this medium has an important self-similar fractal property, which gives significant theoretical insight into its composition. This medium is a very highly entrenched medium permeating through all macroscopic material matter objects, to varying degrees, including clocks and human brains. Meaning that an increase in the density of this space-time medium will have a direct effect on the measured and experienced passage of time at the quantum scale up (at the least). Length contraction in particle accelerators is simply an artifact of the medium’s drag experienced on charged quantum particles being propelled by very strong electric force fields in the accelerator, which utilize the particle’s charge to propel it. Essentially the artificially induced electric force propellant pushes the particle against and through the quantum medium whose drag coefficient increases as the particle reaches c. Basically, the electric force propellant is crushing the propelled object against the quantum medium, against the space-time continuum, which essentially flattens it as v approaches c.
Mass increase is caused by the same effect that causes length contraction. Essentially the increasing quantum medium drag makes the object harder to accelerate, even though the applied force to propel it stays the same. The applied force is constant, and the measured acceleration of the particle is fairly easy to obtain in a particle accelerator, but the problem is as the particle reaches c, the measured acceleration falls out of sync with the force applied to accelerate it. This disparity is measured as a difficulty to move the particle due to an assumed increase in mass, though it’s better to call this calculated mass “apparent” mass. Like I said before, time dilation is really what sets these space-time continuum, quantum medium (qm), effects apart from other known and more tangible types of mediums (ex. water or air). In this application of a very unique version of aerodynamics/hydrodynamics, Time Dilation (TD) is caused because of an increase in the density of the quantum medium (qm) as the object’s velocity v reaches c, where the object starts experiencing an increasing drag due to a aerodynamic /hydrodynamic shock bow compression wave caused by the moving object in the region of the object itself (see diagram above). This increase in density makes all quantum particles in the object more difficult to move, due to an apparent increase in their mass. This includes the electrons in a digital clock and the electrons in a human brain. This includes the atoms in mechanical devices and the atoms in a human body. This increased quantum medium (qm) density directly affects our perception of time mechanically and neurologically. Understanding the mechanistic cause behind Time Dilation (TD) essentially demystifies the effect and time itself. Time dilation can be difficult to understand, which is why I’ll dedicate this post to time dilation which is a very real physical phenomena, and not some invention by Einstein. Einstein, and others before him like Lorentz, conceptualized that time wasn’t constant, more so Einstein where Lorentz didn’t fully agree or understand what the mathematics was fully describing. Einstein solidified the concept with his work, which lead experimenters later on to validate his predictions that it existed in the manner he described, without Einstein giving an underlining mechanistic cause, just a superficial geometric description of the effect. Where Einstein’s work stops short (incomplete), my Fractal Scaling Cosmology (FSC) framework explores and explicitly describes a mechanistic cause for time dilation, along with many other things (see http://www.gpofr.com/distortion-time-dilation-experiment/). What is time dilation? Time dilation is a compensating attenuation on the “normal” passage of time to compensate for the observer’s frame velocity in reference to c, so that the the observer in any frame will always measure c. The velocity of light traveling between different observers, who are themselves traveling at different velocities, travels at a constant c in the same space-time density (quantum medium density as per FSC). The following diagram is in relation to my own work but touches on SRT and common c in all frames. I’ll be approaching the topic of time dilation in a slightly different manner mathematically. I personally love a Pythagorean application to derive modified x and t dimensions that mimics the Doppler Effect on the experience of dimension itself. The Pythagorean approach to time dilation gives a view conceptualization of the actual stationary dimension vs. the experienced dimension involved in a simple geometric presentation. From the Pythagorean diagram above, notice carefully at v = 0 for a stationary observer, c’ = c. This means that our reference to time is through the reference to a constant c, the only true reference. The observer’s velocity doesn’t change the value of c, that is because c in any given space-time quantum medium “material” density (as per my work in FSC) doesn’t change in a non-dispersive medium (source velocity of light source doesn’t add or negate the value of c), and for this to be true along with the observer’s velocity not to affect the measurement of c, that means that the observer’s experience of time must have changed to compensate for his velocity. This doesn’t hold between two different space-time quantum medium “material” densities (as per FSC), but for Special Relativity (SRT) in the same quantum medium density (SRT fits within FSC, as LET fits within SRT). Essentially x’ and t’ are modified versions of x and t dimensions (actually x distance is invariant), and are the versions experienced by a moving observer. Each observer at different velocities in the same space-time quantum medium “material” density will experience different x and t dimensions. 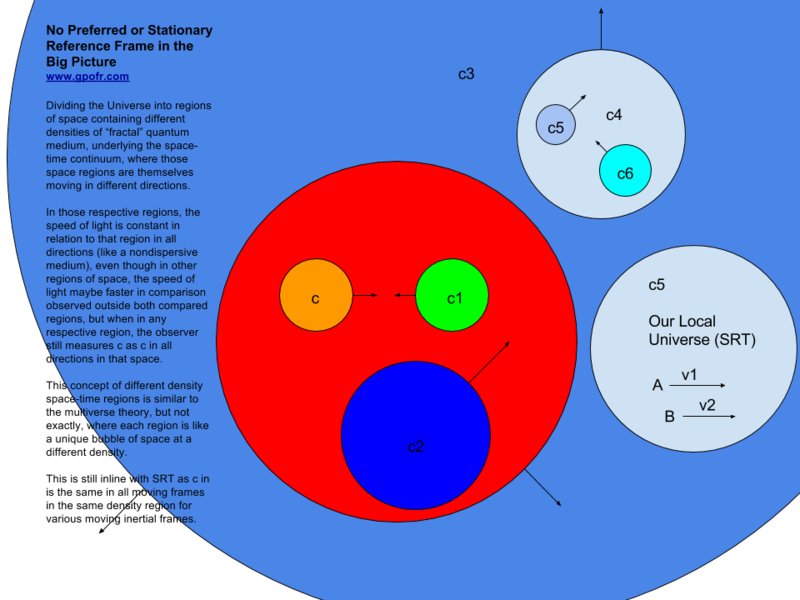 Where c’ is still measured as c within the same frame, because of a modification to x or t dimensions. Since we assume that distance is invariant, therefore x’ doesn’t exist, only x exists. `t’ (c/x) = 1/(sqrt(1 – v^2/c^2))` … look familiar? Since `c/x` derives a time component, since it’s using c and not c’, the time component is considered “proper” time. Now how does this visually translate into a scenario of 3 observers measuring the speed of light for a beam of light from their respective inertial frames (in a non-dispersive perfect fluid quantum medium)? The calculated value of c’ is still experienced by all observers in their respective velocities as c, and this is because time is experienced differently for each observer in their respective inertial frames due to their respective velocity’s affect on the time dimension. So what causes this time dilation mechanistically? From my Fractal Scaling Cosmology (FSC) framework, please read http://www.gpofr.com/distortion-time-dilation-experiment/. But we’re not finished with SRT. How do the respective observers experience/measure the other observers? This is not a very difficult question to answer. What you have to keep in mind is that the beam of light traveling at c is the common reference in all observer inertial frames. From Observer A, Observer C is moving away at near the speed of light trailing the beam of light, and Observer C is aging exceptionally slow (clock apparatus moving exceptionally slow in the inertial frame of Observer C). The trailing part is important here. The distance from Observer C and the leading photons in the beam will keep growing because Observer C is traveling at 0.99c. This is good to keep in mind in this scenario. Now it gets interesting from the perspective of Observer C, and this is where many can get very confused. From Observer C, Observer A appears to be moving away at a velocity close to c, but instead of Observer A aging exceptionally slowly (clock apparatus moving exceptionally slow in the inertial frame of Observer A) from the perspective of Observer C, Observer A is actually aging exceptionally fast yet moving away from Observer C also exceptionally fast. This might appear to contradict SRT at first, but it really doesn’t, because in relation to the beam of light traveling through the space-time medium, through all three inertial frames for each observer, it is Observer C who is actually traveling near the speed of the beam of light, and not Observer A. This becomes even more emphasized when you consider that the space-time medium is a non-dispersive medium, where the source velocity of light does not affect the velocity of the photons (as per FSC), meaning it doesn’t matter which inertial frame is emitting the beam of light (as per SRT). It is very important to cautiously remember, and fully understand, that the beam is common to all frames. Also the distance from Observer A and the beam source will essentially stay the same from the perspective of Observer C in this scenario depicted in the diagram above. Again from my work in Fractal Scaling Cosmology Framework (FSC), the following diagram depicts that in different space-time quantum medium “material” densities, each respective region has its own value for c, yet each observer will still experience the normal value of c in each respective region because of the medium’s density affect the dimensions distance and time, but not across two different regions. Between two different space-time quantum medium densities, light will experience refraction. Here is a simple time dilation experiment documented in my own research work Fractal Scaling Cosmology Framework (FSC) since 2008. It’s based on space-time having an aerodynamic/hydrodynamic-like fluidic characteristic allowing for wave bow shock and tail. The bow shock region in front of a moving inertial body will have denser fractal quantum medium (space-time continuum material density), and the wave tail will be less dense. 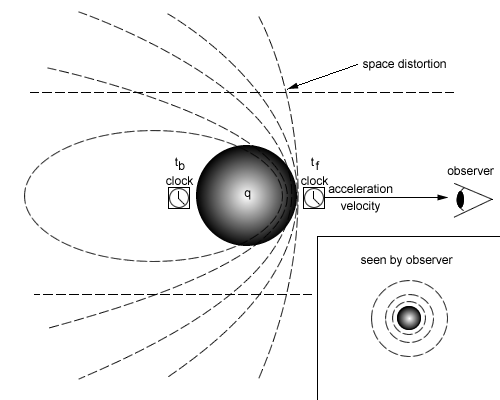 The difference between the two quantum medium densities, caused by movement compression distortion of the medium, can be used to give a potential difference between the two densities, and manifests as a dilation in time between time measurement instruments placed in the two respective density regions of a moving inertial body (in the bow shock, and in the tail). This distortion is attributed to cause and effect. The artificial propulsion of the inertial body pushes and moves the body through the quantum medium, displacing the quantum medium at the quantum scale, forming a wave bow shock and tail around the body as the medium restricts (impedes) the body’s movement when in acceleration. The denser the inertial body, the greater the distortion of the quantum medium. 6. then drive around for a month, or ideally go on a lengthy road trip of 100km/h. The denser the car’s metal construction, like cars from the 50s, the better for this experiment. Also the faster you drive, and the longer the travel, the better for the experiment. Remember that a car travel’s at extremely low velocities in comparison to the speed of light, therefore if the very small compounding effects of a car pushing and ripping through the space-time continuum fabric on the surface of the planet will take a very long time to accumulate enough very small incremental time distortions to finally be measured as an observable time deviation…time dilation. The numerous acceleration phases of the car will also have a compounding effect. To understand how small an impact a car will have generating time dilation by moving at conventional road speeds and accelerations, let’s take a very appropriate analogy of water representing the quantum medium (space-time continuum). At 20C, the speed of sound in water is c_w = 1482 [m/s]. If we were to equate c_w to the speed of light c in a vacuum, then traveling at 100 [km/h] in a vacuum would be equal in ratio to traveling through water at 0.0001372 [m/s] or 0.000494 [km/h]. It is very easy to see that traveling at 0.000494 [km/h] in water would hardly produce any compression density distortion in the water forming a bow shock and tail regions (no matter how slight), because the area around the moving inertial mass would be filled in by the water faster than the object is actually moving. The medium is “malleably” faster than the moving object. This gives Einstein’s SRT a far easier depiction to understand what’s happening. But even given this, there is still a very slight compression distortion as an inertial body pushes through the medium that would accumulate by synchronized digital time measurement devices over time, at least in theory. If time dilation is true, the two clocks will deviate after the experimental run. To prove time dilation, D has to be non-zero (D < 0 < D). The formulation of D in relation to acceleration and velocity is part of my research work in Fractal Scaling Cosmology (FSC). The unit used for D is arbitrary since dimension is canceled in ratio of the same fundamental dimension, but one is given [melo] to describe this factor as a distortion potential value due to an inertial object’s movement. Figure 1: Distortion Time Dilation Experiment, to prove Space-Time material composition, the underlying quantum medium, is a fluidic medium lending to aerodynamic and hydrodynamic like properties and characteristics. This experiment is simple and works on the extended hypothesis that the space-time continuum has aerodynamic fluidic properties that affect the passage of time, and subsequently the measurement of distance. Additionally several configurations (ex. controlled lab, better environmental shielding) and testing cycles can be done (ex. flipping the clocks in different test runs to rule out mechanical issues). More configurations of this experiment can be invented applying the same simplicity. Another experimental configuration is using a lead block attached to a centrifuge armature mechanism with one clock in front of the block, and another synced clock on the back of the block. Bottom line, time dilation exists. It’s empirical fact. Whether it meets SRT formulations exactly is another question. What my experiment attempts to measure is a difference factor in dilation between two seemly equal frames where one is shielded in the direction of movement by a fairly dense inertial body, and the other is far less shielded. And to prove time dilation, this factor has to be D < 0 < D. A non-zero value proves time dilation exists. Giving D a scale proportional to acceleration and velocity is what my own research work involves. But this isn’t the only thing this experiment would prove if D is not zero. A non-zero D value in the context of this experiment additionally proves space-time is fluidic, which proves the technical implication of the GR continuum field equation, which appears based on the perfect fluid continuum field equation. Additionally, the use of digital clocks is to mimic the human brain, because these clocks use electrical currents composed of electrons (quantum particles) to transmit signals, just like in a human brain. Therefore the space-time environmental affect on these clocks would also affect human neurological processes, and microscopic human biological body functions near the quantum scale, in the same way…all of it affecting the perceived passage of time. To clarify, and right out my own work, if the quantum medium’s material density were to increase, movement of quantum particles would be further restricted, would be slowed down, and their inertial mass would increase also (…relatively), and that goes for electrons in the clocks in my experiment, as well as for electrons in the human body and brain. Which leads to the philosophical question of what time is exactly?? You see, when searching for fundamental answers, and finding them, at least believing to have found them, the mystery is gone, as in the mystery of time. What I’ve essentially described here is the demystification of time itself by giving time dilation a fundamentally mechanical explanation, the manipulation of restricting or loosing the execution of sequential events. In this case it’s the restriction of quantum particle movement, which affects macroscopic constructs made from quantum particles. The mystery of time dilation is not mutually exclusive from the existential environmental quantum effects (via the “fractal” quantum medium), in the exact same way electronic clocks are affected by external environmental factors (in a vacuum).